For those who want to enjoy the laid-back island life in an active community, there’s no place like Harbour Lakes, Puerto Rico. As the largest master-planned resort community on the island, Palmas del Mar is complete with top-notch modern amenities the whole family will enjoy. When you’re looking for activities in Puerto Rico, you can start in your own backyard. We can’t call ourselves a beach resort in Puerto Rico without a beach club! Treat yourself to a cocktail while the kids play on the water slide. The Beach Club at Palmas del Mar is the place to be on a quiet Saturday afternoon. With 20 tennis courts, the Palmas del Mar Tennis Club is the largest in the Caribbean. And don’t forget the cross-training: our fitness center features a variety of group fitness classes and state-of-the-art equipment. That’s right: we have not one, but two 18-hole golf courses. The Flamboyan Course was designed by Reese Jones and is considered one of the premier golf courses in Puerto Rico. The Palm Course was designed by Gary Player. Don’t let the stunning views distract you from your swing! 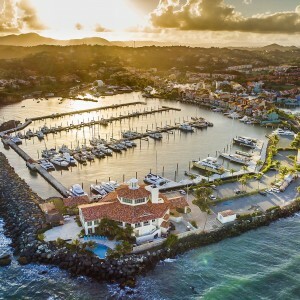 Built to accommodate yachts of up to 175 feet, the Palmas del Mar Yacht Club & Marina has 158 slips and a variety of its own amenities, including facilities to accommodate your special events. Located 15 miles from Vieques and 37 miles from the U.S. Virgin Islands, this is your ideal home port in the Caribbean. Calling all horse lovers! This unique facility is set on nearly 10 acres, with miles of trails and a competition facility. With full-service care for horses, you can be sure that you and your horse will both love life in Puerto Rico. This institution is an English-language college preparatory academy for students in Pre-K through Grade 12. In addition to receiving a world-class education, students can participate in enriching activities like swimming, dancing, soccer, martial arts, music, and more. Looking to dress it up for a night? Come as you are? Stay up late? No matter what you feel like today, you have dining and entertainment options. Sip a cocktail by the water’s edge, try your luck at the casino, or dance to the Caribbean rhythm until the sun comes up. With a secure gated entrance, five different pool areas, a play area for children, and miles of walking paths, Harbour Lakes is an ideal choice when you’re ready to invest in Puerto Rico real estate. We’re proud to be ushering in a new era of island living: modern and affordable, active and adventurous, for those who are ready for a more relaxed and rewarding way of life.